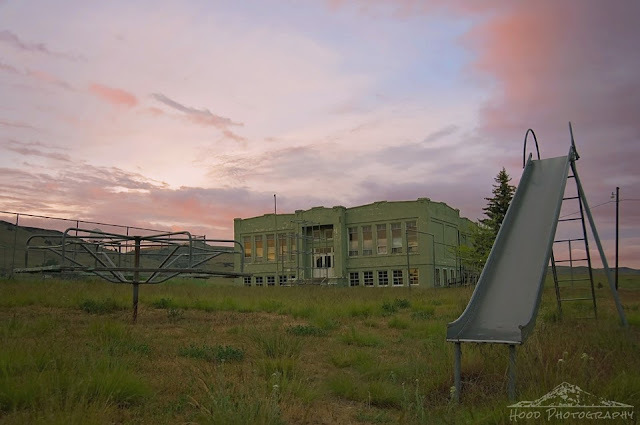 Antelope School, built in 1924, is located in the ghostly remains of the town of Antelope, Oregon. Antelope is best known for its takeover by the Rajneesh group in the 1984. This spelled the demise of the school as a learning institution. For two years, followers of Indian guru Bhagwan Shree Rajneesh used the school as their home. When the commune crumbled, the school was not reopened, and presently the community itself only has 46 residents. While I expected the school to be creepy, it was actually kind of sad. When you peered into the windows, there were still books on the shelves and desks and chairs in the classrooms. A group is trying to get it listed on the National Register of Historical Places. I hope this happens. Curious history there, but what a beautiful sky! The school looks sad! Love the pink sky captures. Happy skywatching, have a great weekend! Shame about the school. Good sky but. Interesting colour contrasts in this shot Sarah. Amazing image. Almost ghostly desolate. This image tells the whole story and the sky is just a beautiful background for a remarkable composition. Really well done. I remember seeing new coverage of that incident on tv. Sad looking scar left from their time there. Love the pink in that sky behind the school. Altogether, another of your beautiful photographs. Thanks! Has a creepy factor that I really love. Could be the cover for a horror film. I love this photo! The colors of the sky are amazing against the building...and the history of the place - all combines to make a lovely photo! Stopping by from Friday Photo Journal! Wonderful image. Sad but with so much beauty. It'd be nice if it were added to the Register of Historical Places.